How the Other Half Lives occupies a premier place on a small list of American books—along with Uncle Tom’s Cabin, The Jungle, Silent Spring, The Feminine Mystique, and Unsafe at Any Speed—that changed public opinion, influenced public policy, and left an indelible mark on history. 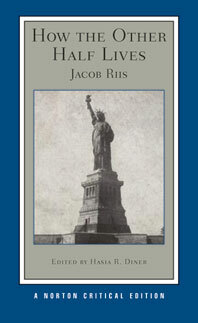 The text of this Norton Critical Edition is based on the 1901 Scribner edition and includes all 47 of Riis’s unforgettable photographs, along with 2 maps. It is accompanied by Hasia Diner’s insightful introduction and detailed explanatory annotations. An unusually rich “Contexts” section includes autobiographical writings by Riis, observations of “the other half” by Riis contemporaries, including William T. Elsing, Thomas Byrnes, William Dean Howells, Lilliam W. Betts, John Spargo, and Lillian Wald, and contemporary evaluations of Riis and his seminal book by, among others, Warren P. Adams, Joseph B. Gilder, Margaret Burton, and Theodore Roosevelt. From the many hundreds of books and articles published on Riis and How the Other Half Lives, Hasia Diner has selected nineteen interpretations of the central aspects of author and work. Among these are Jacob Prager on Riis as immigrant and crusader; Louise Ware on Riis the police reporter, reformer, and “useful citizen”; Roy Lubove on the Progressive Movement and tenement reform; Richard Tuerk on Riis and the Jews; Maren Strange on American social documentary photography; Katrina Irving on immigrant mothers; and Timothy J. Gilfoyle on “street culture” and immigrant children. A Chronology of Riis’s life and work and a Selected Bibliography are also included.